Stakeholders in the Commonwealth of the Northern Mariana Islands (CNMI) have identified college and career readiness as a high priority. Educators in the CNMI are particularly focused on finding solutions to help ease students' transition from high school to college and careers, as many students in the CNMI are placed into developmental coursework, rather than credit-bearing classes, upon entry into Northern Marianas College. To support this work, REL Pacific staff have been working closely with the CNMI Partnership for College and Career Readiness and Success to design and implement mathematics transition courses, which help students transition from high school to college coursework, to better prepare students for success in college-level courses after high school. 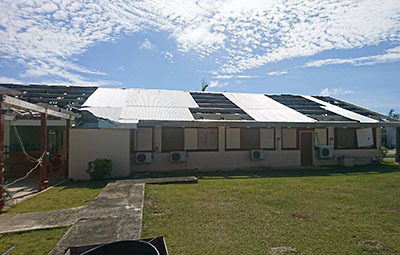 Damage to Northern Marianas College from Super Typhoon Yutu. In October, REL Pacific's work in the CNMI was put on hold when Super Typhoon Yutu struck the islands and caused damage to 90% of Northern Marianas College, a key partner in the transition course work in the CNMI. However, stakeholders in the CNMI are eager to get the work back on track while recovery efforts continue and to move forward with their plan to pilot a transition course in the fall of 2019. To keep the work moving, REL Pacific Managing Researcher Dr. Max Altman will travel to the CNMI to facilitate a two-day training session on March 22–23 to restart this collaborative work, which will focus on creating course content for the proposed transition course. REL Pacific is pleased to be returning to the CNMI to continue the pilot so soon after the typhoon and is looking forward to supporting stakeholders as they work to ensure that students are prepared for credit-bearing college coursework. Learn more about the CNMI Partnership for College and Career Readiness and Success here: https://ies.ed.gov/ncee/edlabs/regions/pacific/partners-cnmi-cc-readiness.asp.